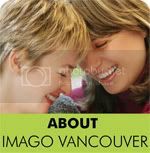 This week we bring you another wonderful guest post by Imago Executive Director, Tim Atkinson that originally appeared on YourTango.com. For Jane, marriage was great once. When she was in her 20’s and even early 30’s it felt romantic and satisfying doing all the domestic things together, having kids, creating a home. Then one day she realized that 15 years of marriage to Robert was stifling her. She didn’t know who she really was any more, except somebody else’s wife and mother. “Who am I? How do I find myself? I’m just in my forties, but my life feels over” she complained. Robert found her new attitude terrifying. She was changing right in-front of his eyes, from contented wife to spiritual warrior. She would come home from Yoga and talk about the lonely path to self actualization. She emphasized the solitary part. “I’m not preventing you from having a self” he would say. But for Jane, she was beginning to feel the only way she could reclaim her life was to leave the marriage and breathe fresh air alone. When the couple came to me for marriage counseling, I gave Jane a challenge. “Do you want to know the best chance to discover who you really are?” I asked her. I explained to her that being free of her relationship might help her feel better, but the best path to personal growth is actually to stay with the one you love. Being alone is emotionally easy, so it doesn’t create growth. You can just choose to hang out with people who say nice things about you, and avoid the others. It’s your significant other who has the power to push all your buttons and also give you more of what you need to heal. The trick is being able to use this experience in a positive way. If Jane left Robert, she would cut off her own potential for growth. 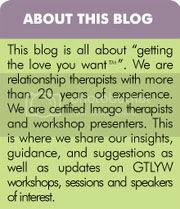 At the heart of Imago Couples Therapy is a belief that the purpose of committed relationships is to enable each partner to develop to their fullest potential. Even conflict, rather than being an entirely negative force, is seen as just a sign that growth is trying to happen. Take a while to look at your relationship as an amazing opportunity to help you both reach your full potential. Explore your differences together, in a constructive way, and you can find ways in which you can help each other to grow. The partner who is spiritual and deep can help their more emotionally reserved partner see more magic in the world. 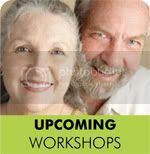 The partner who is safe and dependable can help their more extravagant partner learn to be comfortable with financial planning. If you are traveling a road together, it’s so much better to be pulling in the same direction. Spend some time looking at what you both most want out of your life together. Ask your partner to talk about their dreams, and without commenting on them, simply mirror back their words to show you have heard them. You will find that as the list grows some things you will both want, and some you will be happy for your partner to have. It’s easy for Jane to blame Robert for the limitations in her life. Instead she learned about how he could be the strongest resource she has for self-growth. The Imago Dialogue offers a way to explore your differences with your partner, in a non-judgmental way. By looking at the stories and your personal histories which lie underneath conflicts, you can learn more about each other. Often that leads to finding ways you can each stretch into new ways of being, but with the full loving support of your partner. Back to Jane, who is wrestling with some difficult issues, which aren’t going to be solved overnight. Robert would love the security of knowing that it’s all going to be alright in the end. That’s where it is important for both partners to take time to let each other know how much they love each other, whatever the outcome. One great way is through the Imago appreciation dialogue. Jane is looking for a radical change in her relationship both to life and to Robert. She is feeling stifled in some way, so however hard it may feel, Robert must try to learn about what she is really needing from him, and to see how in a loving way he can stretch to meet those needs. In the same way, Jane can learn to grow by stretching to understand and meet Robert’s needs more. This part can be particularly successful with an Imago professional who is skilled at creating safe and supportive dialogues about things which really matter. But the secret is to become really curious about your partner, and as they talk about their needs, or even their frustrations, just listen. If you speak at all, it might be to show you have heard, by repeating it back, or by gently asking them to go a little deeper and share more. Keep your focus on what it is that is going on for your partner, and try to let go of whatever reactions you have, because they will just obscure your ability to see what it is that is happening for them. This kind of listening and acceptance is the start of deep and loving growth. Yes, Jane can have her life back, but together with Robert she can find ways to have it back that are both deeply loving and shared. On her Imago journey with Robert she has discovered herself more fully. She even feels more romantic just like she used to. They both feel more secure within the relationship.